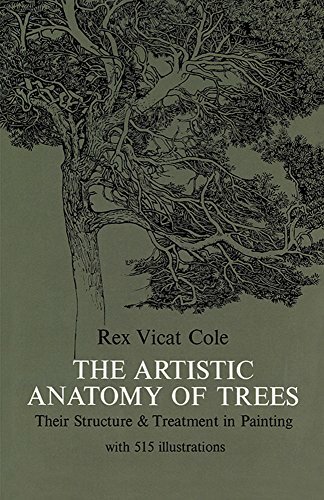 I first knew of this book-The Artistic Anatomy Of Trees when I was looking at Marc Dalessio’s website, which contains some superb plein air oil paintings. The book was one of his recommended reading. The book is published by Dover Publications who have a great reputation for reprinting old classics art books. This book is printed in black and white and covered in depth every aspect of trees. The first chapter gave a comprehensive analysis of painting of trees as the author analysed works by various artist like Corot and Turner. The subsequent early chapters focused on balance and composition of trees in a painting,which makes for an interesting read and understanding of negative spaces and masses of tree. The rest of the chapters dove into every aspect of the tree, such as the anatomy of the leaves, influence of light on the trees and the different variety of trees. There are also ample illustrations of the various examples and tips on how to draw trees, with diagrams to simplify it. But do note that this book is very heavy on text, and the reader needs to invest some time to read them but the reward will be satisfying .You get to appreciate how to draw trees in a new light with this excellent book.